This is a trunk road and so comes under the auspices and responsibility of Transport Scotland and their managing agent, Bear Scotland, previously it was with Transerve. Last time Bear won the tender. Since 2007 I have been engaged in many meetings concerning Tomich junction and the near misses and actual accidents. These meetings have involved myself, Rob Gibson MSP, Transport Scotland and Transerve offices, the Police and Highland Council Safety Officer and Roads officers. The stumbling block was that the Scottish Government who are responsible via Transport Scotland, will not upgrade or put money into a road improvement unless it is a priority due to safety issues, ie these are based on the number of fatalities. So because there has only been one fatality at Tomich caused by a lorry driver’s error, this is not classes as the junction’s fault. I explained time after time that there could easily be another death and I am trying to prevent it, whilst accepting that driver error is often the cause of accidents at this junction, the junction itself lends itself to driver error and therefore accidents. This carried no weight with TS or SG. Moving further forward into 2010 I managed to get TS to agree to do a 2 week video survey of the junction. They provided me with the footage and explained that it was mostly lorries stacking up in the middle section that were the main issue! They said they would emphasise the road markings more and this would be better - they did this but it really makes little difference. They wear off very quickly anyway and Bear have to renew them every 2 years or so. There is even an issue with where the bus stops. TS created a bus stop on the south side of the A9 but there was nowhere to put one on the north side, so buses where stopping in the middle of the Give Way from Newmore, however I understand now that buses refuse to stop there at all. 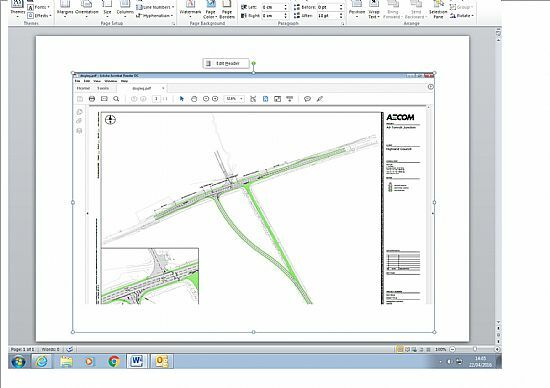 Eventually in 2011 I managed to get to the point in talks with all parties, that if we came up with a plan for what could be a solution for the junction, we could then seek funding in various ways. TS agreed that they would pay for their architectural and technical team to draw up plans and this was done. They produced two options a) a roundabout costing circa £3.2million and b) a dog leg across the field on the southern side of the junction coming out further south of the Newmore junction so that they two junctions no longer criss crossed. The cost of this was circa £1.9million. Large sums of money. TS would be responsible for most of this but perhaps Highland Council could pay for the part that was on their own road, ie the road up from Invergordon. To this end I sought to have inserted into the Inner Moray Firth Local Development plan, that any large development that is to encroach on Tomich junction, must put a commuted sum of money, to be determined, into a central pot to save up enough to match fund any money coming from SG or HC. This was agreed and finally passed in summer of last year (2015). Now I am waiting for a major development. When Balcas was given planning consent, around 2004, the then Planning Committee with the then Councillor Connell on it, did not insist on any funding for Tomich as they had not considered there would be sufficient lorry movements impacting on it. In hindsight this was a mistake as Balcas are now one of the main users of this junction, but there is nothing that can now be done to extract money from them in retrospect. Current situation is that we remain waiting for funding, but as the Highland Council is cash strapped and the Scottish Government only normally fund via priority on their trunk roads, ie on accidents involving fatalities – the future does not look imminently bright! 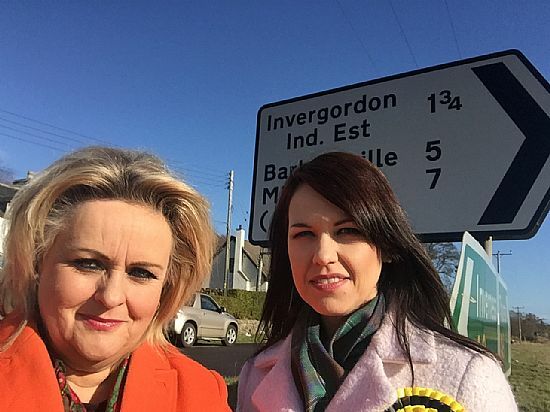 I met with Gail Ross, who intends to become the next SNP MSP for the Caithness, Sutherland and Ross constituency, to show her the dangers and we took some photographs. 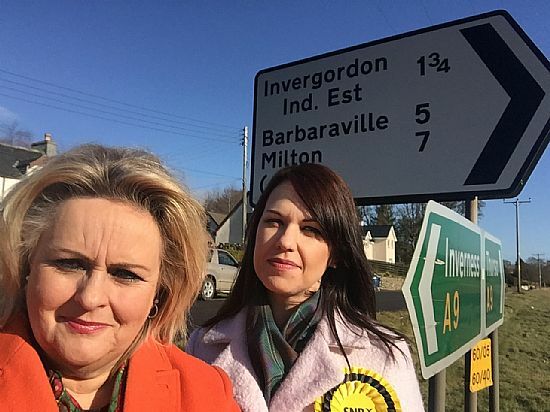 She has promised me she will engage the new Transport Minister in a meeting as soon as she can so that I can see if a new minister may look more favourably on the issue of safety at Tomich junction. I will keep this site updated. This is a long term project and could take many more years to resolve. This is one of the options, a Dog Leg across Achy's field, costs around £1.8million in 2014. The other alternative is a more costly roundabout or ghost island circa £3.2million in 2014.